Chevy finally gets its own midsize crossover SUV that seats 7 or 8 passengers. The Traverse shares styling elements from the Malibu and the Buick Enclave, its sister SUV. Available in FWD or AWD drivelines, the Traverse offers one powertrain choice: a 3.6L V-6 coupled to a 6-speed automatic. An optional dual exhaust adds an extra 5-bhp (286-bhp total). 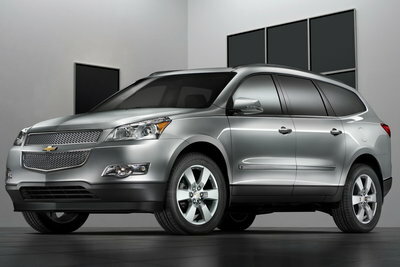 The Traverse is available with 17, 18, or 20-inch alloy wheels, and tires sizes up to P255/55R20. Towing capacity is limited to 4,500 lbs. Available options include ultrasonic rear park assist, rearview camera, DVD navigation, DVD entertainment system, heated/cooled front seats, power folding mirrors, panoramic sunroof, and power liftgate. Chevrolet positions the Traverse as an alternative to the Toyota Highlander, Honda Pilot, and to a lesser extent, the Ford Explorer. The Traverse is an all-new crossover SUV for Chevrolet similar to its siblings, the Buick Enclave, GMC Acadia, and Saturn Outlook. The Traverse differs from these models in that it is some 4 inches longer. Power is provided by a 3.6L V6 with direct injection. Both FWD and AWD models include a standard six-speed automatic transmission.